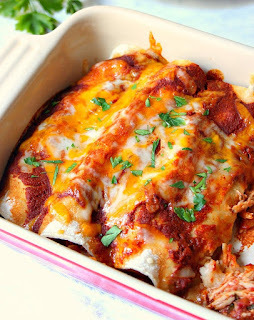 These have to be the best chicken enchiladas that I have ever tasted! They are quite spicy so if you don’t like a dish to be too hot reduce the amount of chilli powder and chillies. This dish can be prepared in advance and placed in the oven when your guests arrive. 1. In a large pan bring the chicken stock to a boil then reduce to a simmer. Place the chicken breasts in the pan, cover with the lid and let poach for 10 minutes. Take off the heat and leave in the pan for 10-15 minutes. Remove the chicken, shred and set aside. 2. Heat the oil in a large frying pan and add the onion, cook until softened. Add the herbs, spices, salt, pepper and garlic. 3. Add the passata and chillies, bring to the boil then add the shredded chicken. Reduce the heat and let simmer for 20 minutes, add a splash of water if the mixture becomes to dry. 4. Preheat the oven to 200°C/400°F/gas mark 6. 5. For the Enchilada sauce, heat the oil in a pan and then add the flour and chilli powder. Stir over a medium to low heat for 2 minutes. Slowly add the passata stirring continuously to make sure you have a smooth consistency. Add the garlic and cumin and a dash of water if the sauce is too thick. Keep stirring and let simmer until it reduces to a thick tomato sauce, season to taste. 6. When the chicken mixture is ready add 1/3 of the grated cheese, sour cream and coriander, mix until the cheese has melted. 7. Lightly oil an oven proof dish, take a flour tortilla and place a 1/8 of the mixture inside and roll it. Place in the dish and repeat with the remaining tortillas. 8. Pour the Enchilada sauce over the tortillas and sprinkle over the remaining cheese. Place in the oven and cook for 15-20 minutes or until the cheese begins to turn golden. 9. To serve, divide between serving plates and top with sour cream and a sprinkling of coriander, enjoy!